What a beautiful day for grilling once again easy and quick so we can enjoy a little outdoor time and a break from the extreme heat and little or no rain…needless to say I’m still without a vent hood, but hopefully will have a shiny new one in the next week or so with a little cabinet redo and maybe I’ll be back in action before the snow falls, oh I don’t want to say that as we don’t get much snow here! I’ll leave it as soon it will be done I will be happy! So maybe when I return from Colorado I’ll have a new to me cooking zone! 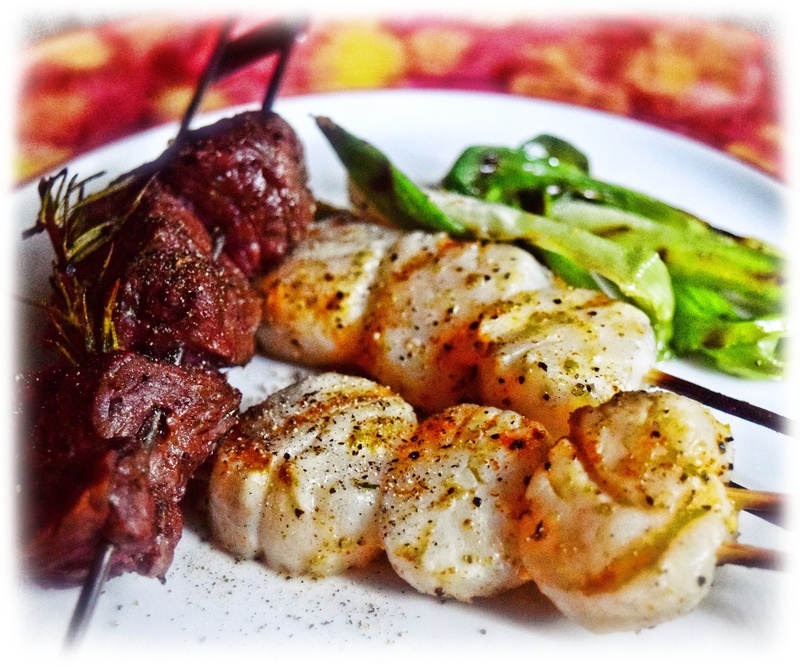 Kabobs take only minutes to grill, especially seafood so I chose some beautiful scallops and one small filet, cut into fat cubes lightly brushed with EVOO and fresh herbs. As Curtis says the beef cubes can be marinate, but my 15 minute marinating time was plenty for the tender cubes of beef as for the scallops drizzles of EVOO, sprinkles salt, lemon pepper, and pinches if Slap Ya Mama seafood seasoning . The scallops are only grilled for 3 minutes where the beef takes bit longer about 3-4 minutes each side. I love to add pinches of porcini powder to the beef kabobs, but remember a little goes a long way and for the scallops. Prepare Curtis’ panzanella ahead of time and add the grilled bread just before serving. While the directions indicate 25 minutes of prep time I would be hard pressed to spend 10 minutes making this salad then again I only made it for 2-4 people. *Notes: Alternately grill thick slices of bread first and remember to rub the hot bread with peeled garlic cloves, cut or tear bread and toss into your already prepared panzanella. This recipe easily reduced or increased…this makes a lot so scale back according to your need and it is easy adaptable, change the vinegar to another favorite, skip the arugula as I did because it looked pretty sad and add some fresh oregano and lemon zest. Enjoy! Panzanella is great alone or with a fantastic side dish to any summer dinner and it screams for a bottle of excellent red wine. The garlic oil can be made up to 6 hours ahead, covered and refrigerated. Bring to room temperature before using. Using a large heavy knife, mash the garlic with a pinch of salt into a paste. Transfer the garlic to a small bowl and add 1/2 cup of olive oil in a slow stream, whisking until combined well. Brush the bread slices with 1/4 cup of the garlic oil. Grill until golden, about 5 minutes per side. Cut the bread into cubes. Whisk the vinegar into the remaining garlic oil. Season the vinaigrette to taste with salt and pepper. In a large bowl, toss the grilled bread, tomatoes, mozzarella, basil, arugula, and shallots with enough vinaigrette to coat. Let stand 10 to 15 minutes at room temperature to allow the flavors to develop, then toss again just before serving.